Pet Rabbit Stories. You’ll enjoy this surprising tale about comical misadventures with two female pet rabbits, babies out of thin air, and a mystery papa rabbit. This true rabbit tale was relayed to Raising-Rabbits by Gillian, a delightful woman from Northumberland in the UK, near the Scottish border. The two pet lionhead rabbits in this story are owned by Gillian’s son Iain, age 9. A year ago we took on this lovely pair of female rabbits. Son Iain was so good at looking after his wee charges, that he also wanted guinea pigs, which he got with his own ££. We’ve had lots of fun with them all. We never looked at these rabbits as anything other than pets that would ever amount to anything more, especially not since they were already more than 2.5 years old. 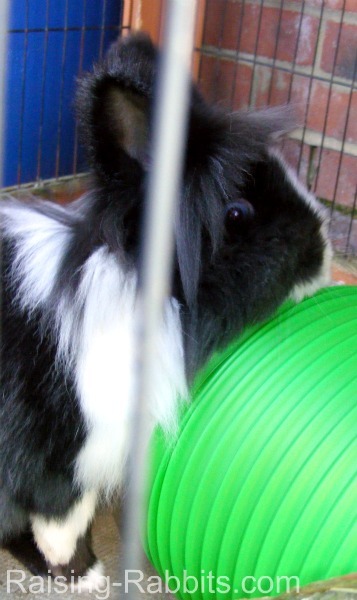 We certainly didn't expect to be able to tell this pet rabbit story. But then we got the shock of our lives!! And then I found blood. Had they been fighting? What would I do when I found out which was injured? I shooed the guineas out of the way of my tidying, and emptied the spent bedding into a bucket ready to dump on the compost heap. And then something moved! Not mice in there as well, was my first thought. But then... Oh no!! 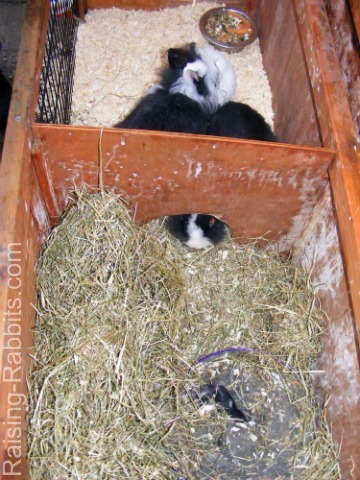 We borrowed another hutch for the wee family and made a nest for them from a sweetie tin (having seen your blogs). Whichever of the rabbits is the Mum, she seems to be doing a great job. The tinies are all well with lovely fat tums in the morning. Their fur is now coming in nicely. The eyes and ears are still closed. We left the parents together as they are a really strongly bonded pair and I felt I'd cause them distress if they were separated from one another after being together so long. Also we didn't wish to end up with dead kits from removing the wrong parent. Not sure we want any more kits, but upset parents would be even worse. We’re hoping that having taken over 2 1/2 years for the first litter to appear that they will not be in a hurry now either. Fingers are crossed!! First, the borrowed wee hutch decided to fall apart and scatter bunnies all around the garden, so we gathered them up and popped them into the large original hutch. Fine, you'd think, but oh no, the two originals decided that the larger quarters had to be fought over. The fur was flying. I dived in and divided the rabbits. I popped the one we thought was Mum in a run, remade the hutch as best we could as dusk fell, and then added the kits back in, leaving the other rabbits in with the guinea pigs. A deep sigh - all was well. Well, whilst we were away the nails were to be clipped. Whilst that was taking place a wee look to the undersides was in order to make sure we knew for sure males from females. Our neighbour sexed the kits as 4 boys and 1 girl. 1 girl and 1 girl = 2 girls!! AAGHH!! So how do we have tinies then?? We have never seen a wild rabbit in the garden in the 5 years we have lived here. None of our plants have signs of rabbit munching. None of the rabbits or guineas have ever escaped from the hutch; the run section is under their bed area. So we’re hilariously trying to imagine a wild ‘invisible’ buck rabbit being so attractive to my deprived female that she pops her rear end up to the bars and this buck is so desperate that he manages to mount her 'vertically' clinging to the bars rather than embarrassing her!! Well, you can only laugh at the image the whole process conjures up!! 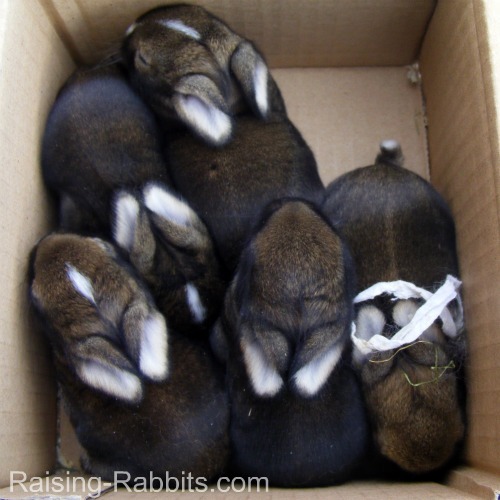 So now I have the delight of trying to find new families for half-lionhead - half-wild rabbits!! I don't think that there will be quite the same enthusiasm for them now, but it does explain the wild colouring that they have that I'd been trying to understand!! We’ve been handling each of the kits every day so hope they will be friendlier than their parents and used to children. I think that this is a rather fitting next chapter in my first experience of raising rabbits, don't you?? Many thanks again - I hope this has brightened your day. I giggled for days when I found out what had gone on! 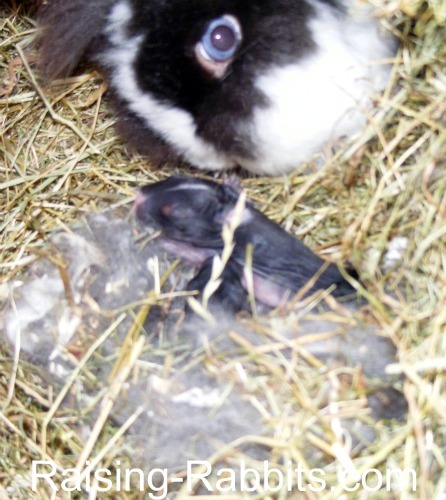 Gillian gave us permission to post her amazing pet rabbit story on Raising Rabbits. As she said, "At least your hands won't be shaking like mine were when I found the kits!!" Thanks, Gillian! Your pet rabbit stories are certainly entertaining, and even instructional for many who love rabbits. Note: All photos on this page are the property of Gillian, are watermarked as posted on Raising-Rabbits.com, and are used by permission. Please do not copy. Thank you. Do You Have a Great Story About Your Pet Rabbit? 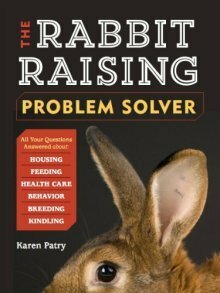 Is your rabbit entertaining? Fun? Or not? I'll bet lots of other pet rabbit owners would love to hear it! Write your own page and tell the world about your pet rabbit. You can include up to 4 pictures, too. (A Quick Note from Raising-Rabbits to our readers who may be as surprised and as intrigued as we were! These kits do not exhibit lionhead wool. What’s more, both lionhead rabbits in this true story are 'self' marked, which requires two recessive genes. 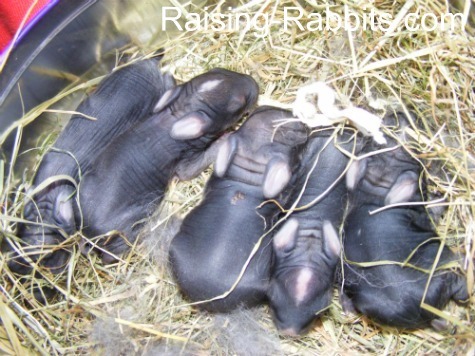 Even if one of them were male and they mated, they could not possibly create these bunnies, which all have at least one dominant genetic gene as evidenced by their wild-colored agouti fur. There had to be a third rabbit...somewhere!